Benson, NC: Mrs. Doris Strickland Lee, age 91, of West Parrish Drive died Tuesday, February 5, 2019 at her residence. Funeral Services will be 2:00 PM, Thursday, February 7, 2019 at Rose & Graham Funeral Home Chapel in Benson. Officiating will be Chaplin Sharon Eldridge, Mr. Joe Dan Lee and Rev. Al Hocutt. Burial will follow in Roselawn Cemetery, Benson. 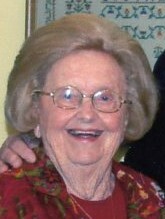 Mrs. Lee was born February 22, 1927 in Johnston County to the late Willis Strickland and Eva Hodges Strickland Garwood. She was also preceded in death by her husband, Junius G. Lee and brother, Earl Strickland. Mrs. Lee was a graduate of Benson High School and a retired secretary for McLamb Brothers Hog Market in Benson. She was also a member of Benson Baptist Church. Surviving are her children, Brenda Utz of Fayetteville and Glenn Lee and wife, Mary Ann of Benson; grandchildren, David Lee Utz, Brian Utz, and wife, Xuan, Mary Helen Sills and husband, Marvin and Charles Daniel Lee and wife, Amanda; great-grandchildren, McKinley Sills, Maddox Sills, Mary Charles Lee, Anna Leighton Lee, Lydia Lee and Tyler Dang Utz; sisters, Jewel Geesin of Clayton, Bobbie Weeks of Dunn and Lynn McCaffery and husband, Tim of Little Washington; several nieces and nephews. The family will receive friends from 12:45PM - 1:45PM Thursday, February 7, 2019 prior to the service at Rose and Graham Funeral Home in Benson and other times at the home. In lieu of flowers, memorials made be made to Benson Baptist Church, P.O. Box 323, Benson, NC 27504; Benson United Methodist Church, P.O. Box 72, Benson, NC 27504; or 3HC, 821 N. Brightleaf Blvd., Smithfield, NC 27577.